Pancakes are one of my favorite recipes to make around on the weekends for my kids. They always ask for them and I’m always happy to oblige. 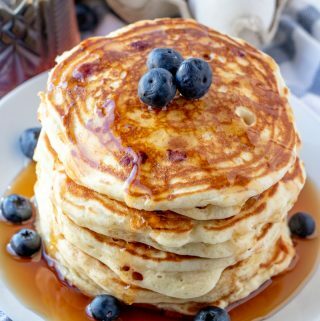 These Blueberry Pancakes are one of their absolute favorites. 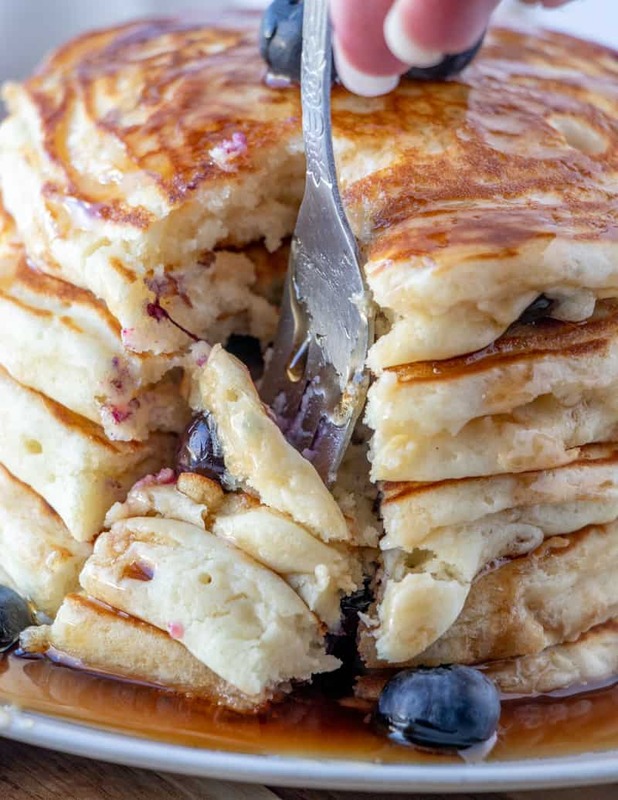 You can also check out some of my other favorite pancake recipe such as these Banana Pancakes, Oatmeal Pancakes and these Sheet Pan Blueberry Pancakes. This simple recipe is easy to whip up and has a touch of sweetness with the addition of vanilla and the blueberries mixed in. 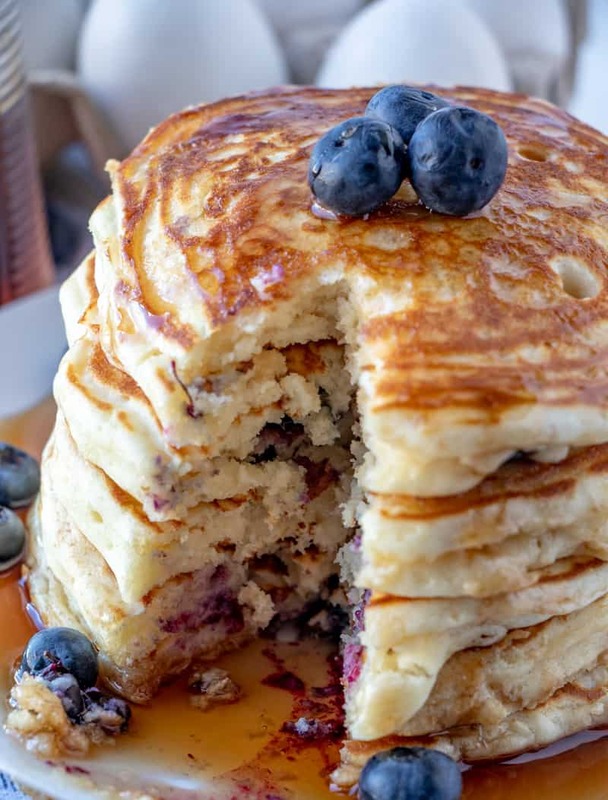 The blueberries don’t pop through so it’s easily able to not see them, but that just meals that this blueberry pancake recipe is just as fluffy as they come. Simple ingredients are all you need that you have usually have around the house if you are a baker of any sort, if you are not a fan of blueberries you can easily leave them out and just have regular old fashioned pancakes. Whisk together flour, baking powder, salt and sugar until combined. In another bowl whisk together milk, egg, butter and vanilla. Fold in your wet ingredients into your dry ingredients until just combined, batter may be lumpy and that is ok.
Let the batter rest for about 5 minutes. Heat a non-stick skillet on stove over medium-high heat and spray with non-stick cooking spray. Pour or scoop the batter onto the pan in 1/4 cup measurements, gently spread the batter out some then press blueberries into the batter. Cook on each side for about 3-4 minutes until you see bubbles forming on top of batter, and the underside is golden. Flip until browned on other side, remove to plate to repeat until all batter is used. This is really a fail proof recipe. I have always had fears about pancakes just for the simple fact that I was scared to flip them. We have found that using and wide large spatula really does the trick when flipping these pancakes. Let your batter rest slightly, this will give the gluten time to activate and for the starches to absorb the liquid in the batter. DO NOT overmix your batter, just mix the batter until it is combined. If you overmix your batter is will result in tough to chew blueberry pancakes. Always spray your pan with non-stick cooking spray, even if you pan says that it is non-stick, this may not be the case, I have cooked many things in non-stick pans that in fact have had many things stick to them. Always pre-heat your pan, you can test the heat by flicking some water into the pan and if it sizzles it is ready. 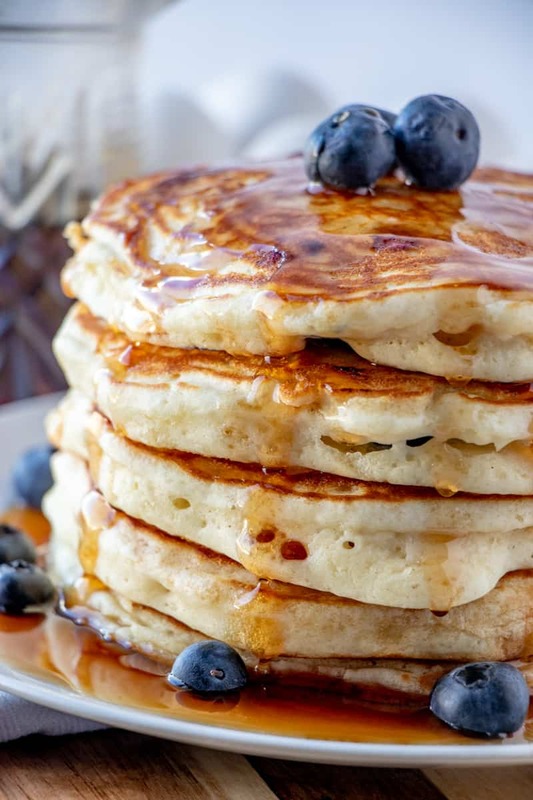 Make sure you wait for bubbles to form and burst on the surface of the pancakes before flipping, you want the optimal doneness and this is something that you will want to watch out for. 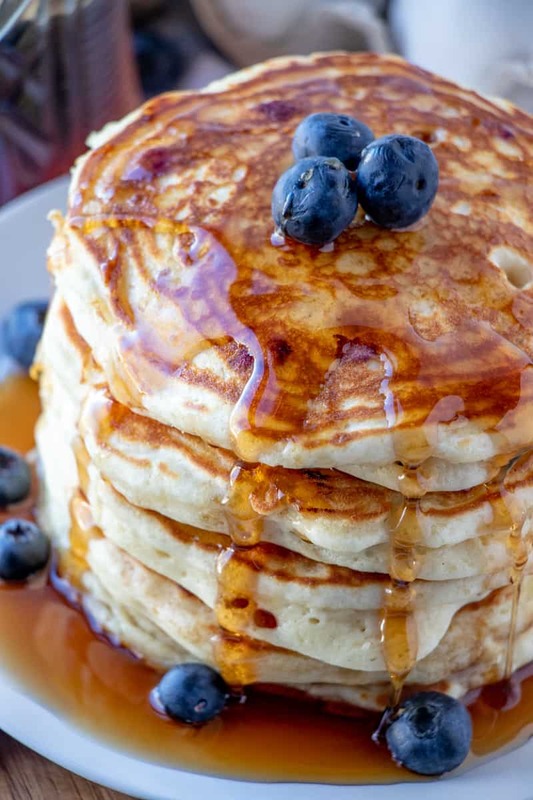 Use a 1/4 cup measuring cup to measure the perfect sized pancakes into your pan, we have always scooped using a measuring cup, it makes sure all your pancake are equal in size. 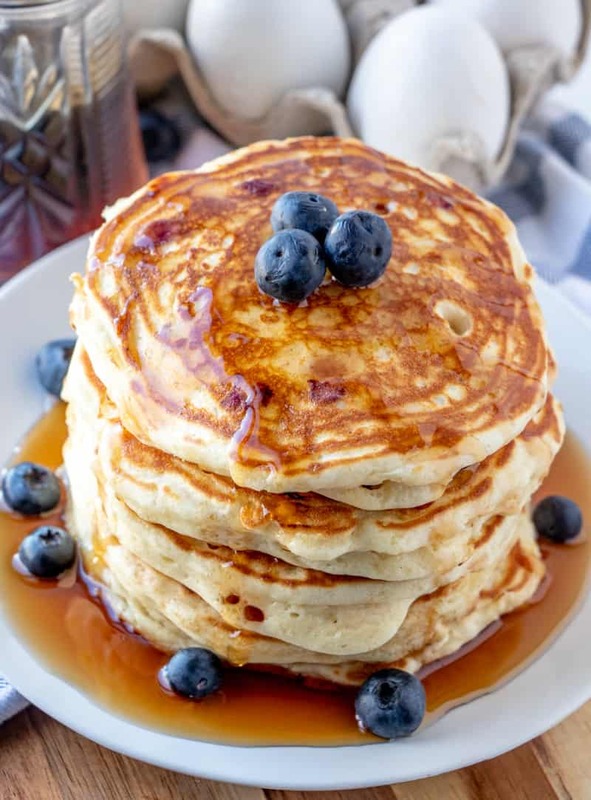 If you want the perfect breakfast recipe these Blueberry Pancakes are are a hit in this house and you will not be disappointed. They are fun, flavorful and everyone loves them. Fold or whisk in your wet ingredients into your dry ingredients until just combined, batter may be lumpy and that is ok.
Cook on each side for about 3-4 minutes until you see bubbles form and burst on top of batter, and the underside is golden.